Take a look at this wonderful one level home for sale in Springdale, AR near Har-Ber Meadows in the Porthaven Subdivision - in the Harber School district! 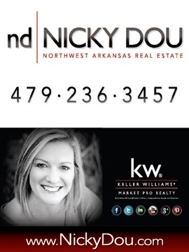 Visit Nicky's new website to search all home for sale in NWA - www.NickyDouMLS.com or Nicky's main website for great info. about NWA @ www.NickyDou.com HAPPY HOUSE HUNTING!